Here we are for another SSS, I haven't been doing them lately because, well I haven't sewn anything. I have been getting Eliza's closet ready for summer and realized I don't have much for her. I am sure most people think I have plenty, but I like to have a lot of options for her, and the more I have, the less often I have to do laundry. 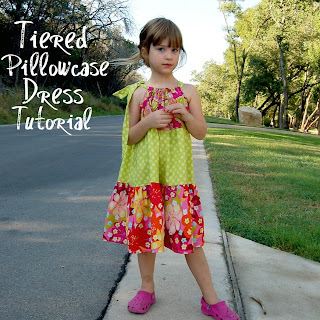 I started looking at tutorials on how to make her a Pillow Case dress and it seemed so easy. All of the YouTube tutorials tell you how to do it, but not the sizing and pattern. I decided to grab a pattern while I was at Jo-Anns picking up some other things. The sweetest lady helped me, she showed me how to pick out a pattern, how to read the package for the things you need and pick out my fabrics. I got home, put Liezy down for a nap and got all of my supplies ready. I pulled my pattern out and OH MY WORD, it is so overwhelming. So here I sit, with a pattern, fabric and supplies and no clue how to read it. I am incredibly overwhelmed and already frustrated. I have folded the pattern back up and slid it under the couch. Maybe that will be a project for a different day. Since I am unable to show you the best way to make it, here are a few great tutorials on how to! Sorry for being lame this week, I just don't have the brain power to figure it out! Hopefully in the next few weeks I will master this! It might not be boutique quality, or even leave the house quality, but it is made! I definitely learned how to do some things, and how to do it different. 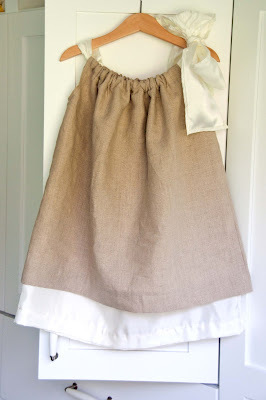 I can't wait to try and make another one, with a little more time, patience, and RUFFLES! Don't mind the picture, she refused to stand still for me so I had to go outside the door and have her stand and watch the kids next door play. I think it is a reasonable cost, for something custom made with love. Not including sewing machine(obviously) or thread since I had both it was about $7. I am going to return the pattern, it was too complicated and the one I printed off here http://littlebiggirlstudio.blogspot.com/2009/02/pillowcase-dress-tutorial-dress-girl.html was much easier. I only needed about a yard of fabric total, .5 of each color and I didn't use all of either of them. I buy my fabric at Jo-Anns, I always use coupons(they come in the mail, email, and they have an iphone app that has coupons). I look for fabric that is on sale first, if it is not on sale I use a coupon on it. Their cheaper fabrics are called Calico they are about 4.99 a yard, and with a 50% coupon only 2.50 a yard, since I only needed a half it was about 1.25 for the piece. Calico is on sale quite often.